To my brothers, I’m known as a little bit of a thief. If they are missing a cool mechanical pencil, book, or shirt (don’t judge me, it’s big and soft!) they usually come chasing after me and have a good reason to do so. My most recent plunder was a book that they had talked about called The China Study. In this non-fiction work, the author backs up a plant-based diet on a 27-year study in China as well as with various other publications. As a vegetarian (who at the time consumed dairy) and a science major I thought this would be a worthwhile read. What I found most surprising was the pivotal point on how detrimental milk is in relation to the top health diseases in America such as heart disease, obesity, diabetes, common cancers, autoimmune diseases, and other health issues. The studies on bovine milk were not an overview but particularly on milk proteins such as casein (which makes up 87% of milk protein) and how it affects humans adversely. For me, the burning question began with how is milk protein metabolized differently in comparison to plant-based protein? However, science has not explored that topic with detail so I moved on to the next probing question: what is fundamentally and molecularly different about casein and plant based protein? Before jumping into answering this inquiry it’s best to learn how the enemy, milk, was isolated as the culprit. On a side note, if you are planning on having milk and cookies or ice cream while reading this I would highly advise you to pick another beverage because you might not want to consume that at the same time as reading this entry. The first question that I wanted to know is how did Dr. Campbell, the main investigator and author, discovered that casein from milk could exacerbate diseases such as cancer. Campbell redid an original experiment by Indian researchers, Madhavan and Gopalan, who demonstrated the effects of dietary protein (casein) on carcinogenesis of aflatoxin, a fungus-produced toxin found in peanuts that caused liver cancer in rats (Campbell 24). 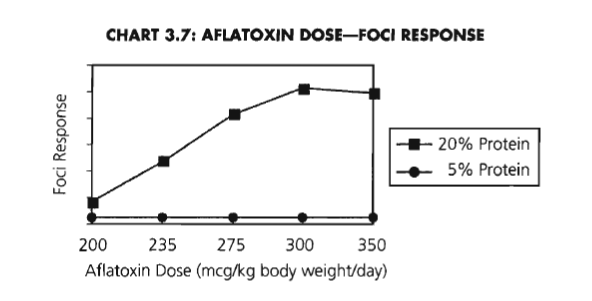 Below is a diagram illustrating how aflatoxin works its magic to create havoc (Campbell 49). As a brief review milk protein is made of whey and casein. Beta-lactoglobulin is the most prevalent protein in whey; whereas, alphas1 casein is the most prevalent protein in casein. Because there are no current 3-D protein structures of any of the casein proteins, below you will find a jmol of bovine beta-lactoglobulin. But remember, this study focused only on casein. 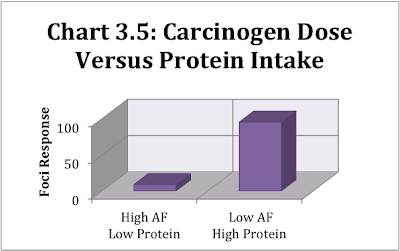 Using what is said to be one of the most potent carcinogens (aflatoxin), Campbell recreated the study to correlate cancer and protein intake. This included two groups of rats where both were given aflatoxin and one was fed a 5% protein (casein) diet while the other had 20% casein. Now, in order to measure the growth of cancer the researchers looked at foci growth instead of measuring the growing tumor. 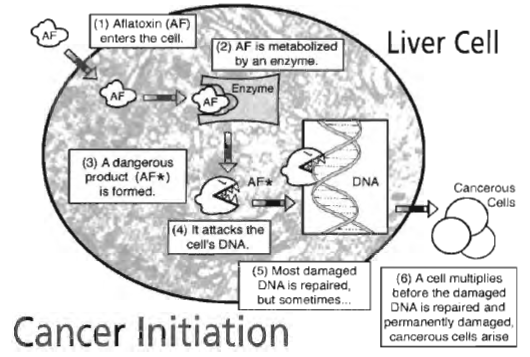 Practically speaking, measuring a full grown tumor in a rat would take many weeks and thus too much time and money; consequently, they observed tiny clusters of cancer cells (foci growth) after cancer initiation was complete. Although foci growth does not always grow into tumors it is a predicative measure of tumor development. Below are the results to the experiment. Please note how there is a lack of error bars in all of Campbell’s charts in the book. The reason for this could be that the author wanted to create a visually simpler image; however, this is not a scientifically accurate practice. 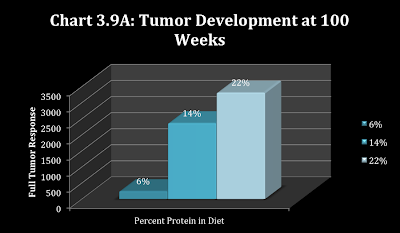 The chart 3.4 supports how an increase of animal protein correlates to the increase of foci growth, which also predicts tumor development (Campbell 55). In order to eliminate other factors, Campbell also changed variables in a following experiment. Namely, the researcher wanted to eliminate the question whether the level of carcinogen affected the tumor growth as well. 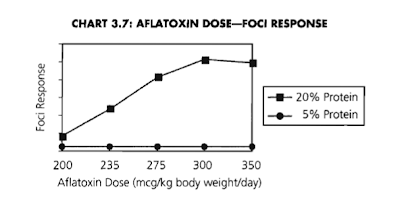 The chart 3.7 (Campbell 59) and 3.5 (55) roughly summarize how foci response is unaffected by the amount of aflatoxin and supports that foci response is solely based on amount of animal protein. After demonstrating the possible effects of animal protein Campbell was able to obtain funding to be able to give concrete evidence (aka show actual tumor growth). He was able to carry a 2-year study (average rat lifespan) to further support the protein vs. cancer relationship. The results are listed below in Chart 3.9 A (61) and 3.10 (64). 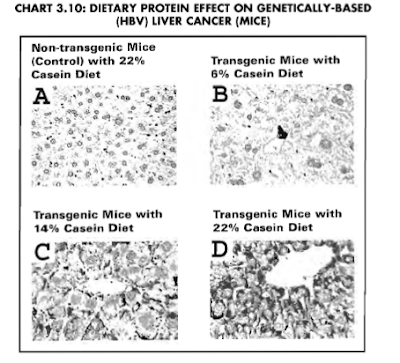 In this particular study, what I found actually remarkable was that every single rat that had 22% casein in his or her diet died from liver cancer. That means 1000/1000 rats died of the same cause without an anomaly or other reason. This kind of result in scientific experiments is absolutely rare. 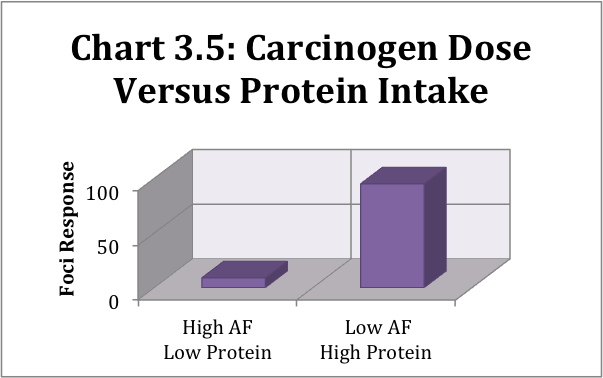 After digesting this information, Campbell concluded the chapter with a study that now focused on types of protein with the same aflatoxin dosage as seen in the previous test. Viewing chart 3.8 confirms Campbell’s hypothesis of the detrimental effects of animal protein in high dosages in relation to obtaining liver cancer (60). Phew. The abstract is now officially over! 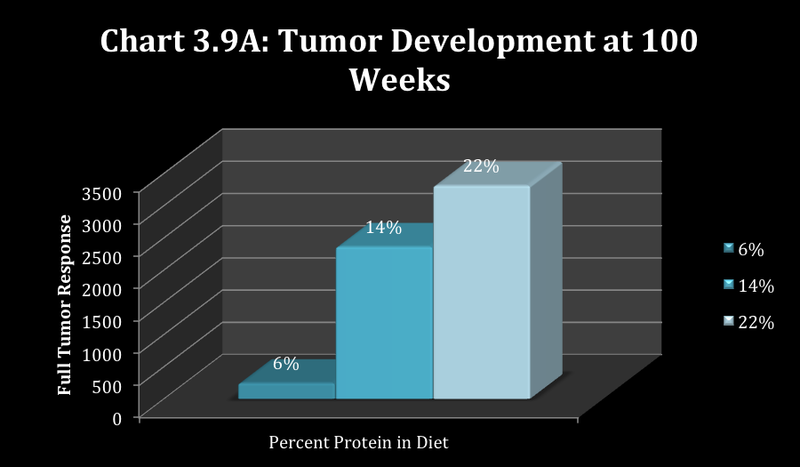 Now that all the charts and pictures are presented, I hope you have a good understanding of the relationship between animal protein (mainly casein) and cancer. In the beginning I had mentioned that Campbell referred to animal protein creating a detriment to major diseases such as heart disease. Heart disease is no trivial health issue. Did you know that over the next 24 hours, three thousand Americans will have heart attacks which is about the same number of people who passed away due to the terrorist attacks on September 11th, 2011 (Campbell 111). Because of the prevalence of this disease for the remainder of this blog I want to hone in on the effects of animal protein and cholesterol, one of the causes of plaque, which is one of the key components of heart disease. So in order for us to dive into this topic we do need to go over key definitions. Made in the liver and the percent of cholesterol found in the blood as a result of eating dietary cholesterol. Remember there are many metabolic processes and required nutrients to make BC so please do not create a direct correlation between DC and BC. Very low-density lipoprotein is the main lipoprotein transporting triglycerides in the circulation. It is similar to LDL where it can lead to direct foam cell transformation and raised plaque formation. A form of fat made in the body. Elevated levels of this can be caused by obesity, physical inactivity, smoking, excess alcohol consumption, and a diet very high in carbohydrates (60% of total calories). High T is correlated with high cholesterol levels (plus high LDL and low HDL). High blood sugar affects those who have diabetes. So let’s put his money where his mouth is! I sleuthed around different scientific databases and amassed two articles that proved to be very helpful: “Comparison of Actions of Soy Protein and Casein on Metabolism of Plasma Lipoproteins and Cholesterol in Humans” by Grundy and Abraham and “Soy Consumption and Cholesterol Reduction: Review of Animal and Human Studies” by Iwami. In Grundy and Abrams’s experiment there were fourteen patients who were hospitalized in the metabolic ward (245). These patients were given a liquid diet containing 30% of calories as lard, 55% as glucose, and 15% as protein (either casein or soy protein) (246). The caloric intake was adjusted to maintain body weight and measurements were analyzed by drawing blood twice a week (246). It is important to state that there was a mixture of hypertriglyceridemic patients as well as normotriglyceridemic patients. Now it’s important to point out that we are honing in on not only protein type but also rates of blood sugar/cholesterol levels. The results (drumroll please!) show that for the two patients with hypertriglyceridemia that had soy versus the casein digesters had significantly lower levels (p < 0.05) of triglycerides as well as lower VLDL-C levels (247). However the levels of LDL concentrations rose and levels of HDL stayed the same (247). On the other hand, the normotriglyceridemic patients on either soy or casein showed no significant changes in the mentioned lipid profiles. Below is a chart to better visualize the results. This study shows us how levels of lipids changed during a month’s time but it didn’t give an explanation of what the diets the patients had before the study. 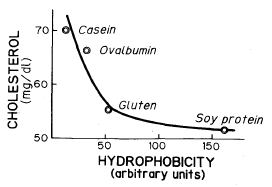 Luckily, I was able to find a brilliant graph demonstrating levels of serum plasma when a diet changes from soy protein to animal protein (Carrol S596). So my next question is what is fundamentally different from plant protein and animal protein? The answer to the question for Iwami, Sakakibara, and Ibuki was the difference in the hydrophobic nature of the two proteins. 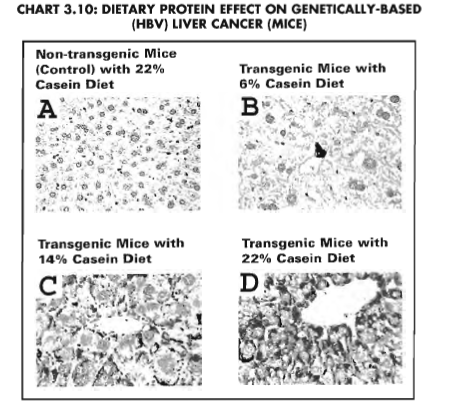 They fed rats diets based on different protein components (all roughly made up 20% of the diet); casein, ovalalbumin (from eggs), soy protein isolate, or wheat gluten (Iwami 1217). The rats were given water for 2 days and then 200 mg of peptic digest of either animal protein or plant protein. After three hours, the digestive tract was examined for levels peptide and cholesterol content (1218). Hydrophobicity was measured by an increase in fluorescence intensity. 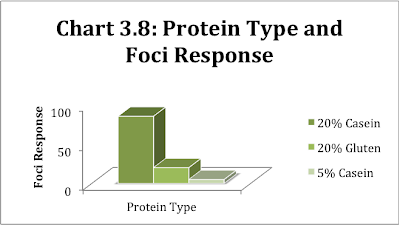 The chart below shows how fluorescence changed from intact protein to pepsin digested protein and subsequently to pancreatic digested protein (1220). The lower the fluorescence meant that the protein was more hydrophobic. By looking at the results the highest decrease (most hydrophobic) to lowest follows as: soy protein, wheat protein, ovalbumin, and casein. The scientists then measured the cholesterol and plotted this with hydrophobicity. The results are shown below (Iwami 1220). Another brilliant measurement they made was how these different proteins were bound in bile acids (Iwami 1220). Why is this important? Cholesterol from food is converted to bile acid where it is eliminated in the bile everyday! The fact that soy is able to bind so well to the bile demonstrates how plant proteins diets are lower in cholesterol because cholesterol is excreted in the feces. 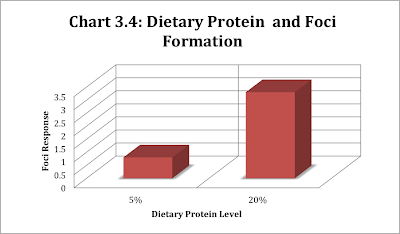 Through these charts and explanations hopefully you can now see the correlation between protein and cholesterol and how the question arose in the first place! 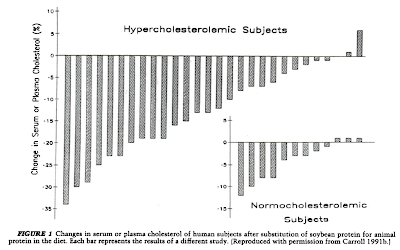 Here we can see how Campbell’s claim is indeed valid as the charts above show the relation of how animal protein (due to lower hydrophobicity) leads to higher blood cholesterol levels. 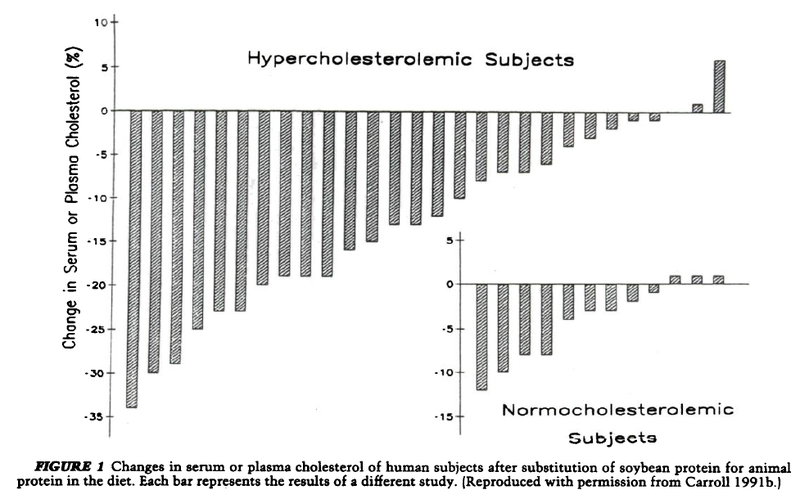 With this claim it would be safe to assume that all people who change their diet to a plant-based one will be ensured to have lower cholesterol; however, this is not the case with human studies since plant-based diet had no affect on normotriglyceridemic patients (Grundy). Although the process to get to this answer is lengthy I really wanted to show you my journey to this question and also my personal decision to turn vegan from vegetarian (consuming eggs and dairy). My family has a long history of cholesterol and it’s so strong in our genes in fact that even my brothers had moderately high (greater than 200 mg/mL) levels at one point in their early twenties. Two weeks from the transition my cholesterol measured 189 mg/mL which is still “normal” but closer to 200 mg/mL. After two months of avoiding cheese and my occasional succumbing to nutella (I bought my own hazelnuts to make my own without skim milk!) the results revealed how my cholesterol did not change significantly. I was retested three months later with 201 mg/mL. After discussing these results with a licensed physician she stated that the difference was negligible. With the combination of my healthy diet and exercise I was to not worry about the cholesterol levels though it bordered at the high level. Personally, I was disappointed with the lack of change but I am happy to have explored different options! I had a great time pushing boundaries and challenging myself this semester by being vegan. Below are some of my creations where I learned how to steam vegetables for the first time, use chipotle peppers in adobo sauce, and cook with cactus! Dill, crushed black pepper, and cucumber slivers with homemade hummus on vienna bread. To drink: fresh strawberry, blueberry, raspberry smoothie with crushed flaxseed, almond milk, and rice protein. Vegan Chocolate Cake with vegan icing for my roommate's birthday! Buckwheat pancakes with crushed 100% cacao chocolate. Asian inspired noodle soup (mushrooms, celery, etc.) with asian style marinated and baked savory tofu. Pineapple quinoa with red pepper, leeks, edamame beans, seasoned with mint leaves and basil with a topping of toasted cashews! Soy and chilli sauce for dipping! Curried celery soup (puréed apples, celery, & leeks) garnished with crushed black pepper and toasted almonds. We have napolita (cactus),mushroom, potato, and onion spiced medley, refried jalapeño beans, fresh guacamole seasoned with sea salt, lettuce, sprouts, a pinch of lime, and who can forget Valentina salsa. Campbell, Angus. The China Study. Ann Arbor, Mich: Inter-University Consortium for Political Research . Print. Carrol, KK. And EM. Kurowska. “Soy Consumption and Cholesterol Reduction – Review of Animal and Human Studies. The Journal of Nutrition 125.3 (1995): S594-S597. Grundy, Sm., and JJ. Abrams. “Comparison of Actions of Soy Protein and Casein on Metabolism of Plasma-Lipoproteins and Cholesterol in Humans.” The American Journal of Clinical Nutrition 38.2 (1983): 245-252. Iwami, K.K. Sakakibara and F. Ibuki. 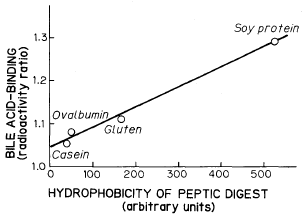 “Involvement of Post-Digestion Hydrophobic Peptides in Plasm Cholesterol-Lowering Effect of Dietary Plant-Proteins.” Agricultural and Biological Chemistry 50.5 (1986): 1217-1222. Well, I was very interested to read your paper because I am an animal science major, and therefore, a strong supporter of consumption of animal products. I thought your paper was well written and easy to follow and understand the chemistry. I have a couple of questions though. First, has there been anymore recent studies on this topic? Most of your resources were from the 80s, so I was just curious if the research simply stopped there and nothing else has come of it. Also don't you think that the consumption of animal protein is ok as long as it is in moderation? Also is the high cholesterol really from the protein, or the fat found in the animal products? If it is the fat, then why don't people try to consume leaner cuts of meat, or drink skim milk. There are even eggs that are lower in cholesterol now, and they still come from chickens. Anyway just some questions that your paper brought to mind. Great job! I tend to agree with the poster above. You found some good data, but it seems to be a bit outdated. I agree that overconsumption of animal products can lead to health problems, but is it really the protein causing this? 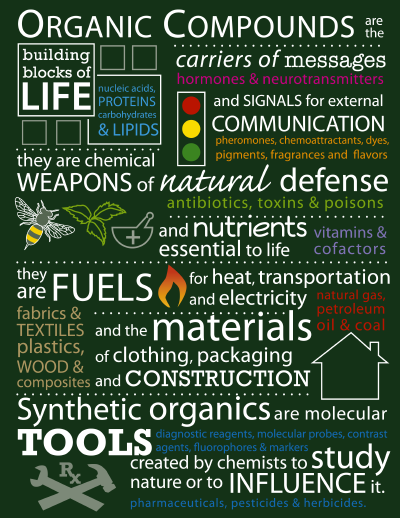 There are many benefits to consuming animal products that are hard to replace with other foods. In fact, I have found an article explaining that children who avoid drinking cow milk have low dietary calcium intake and poor bone health. 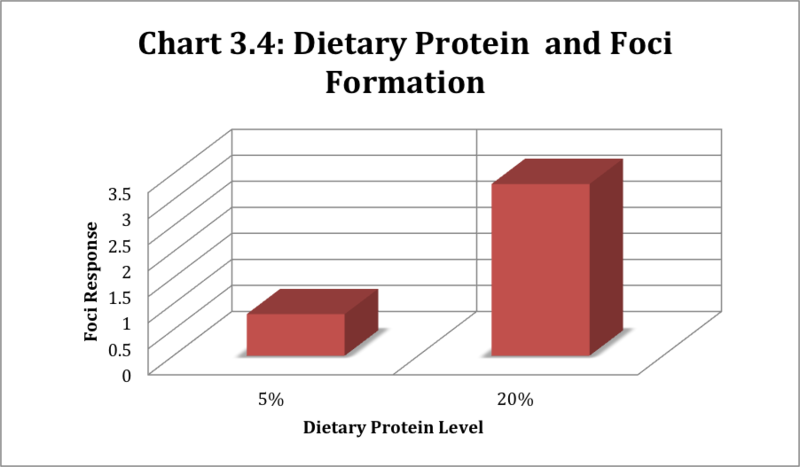 This goes to show that while the protein can be replaced elsewhere, some components are likely not. Nevertheless, you raise some good points which will force me to watch my diet closely.